Kreinik Mfg. 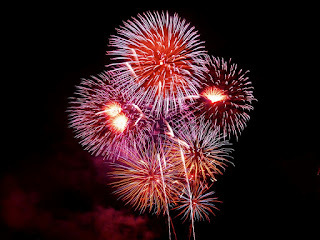 Co., Inc. will be closing for a summer holiday June 30 - July 8, 2012. We will re-open for business on July 9, 2012. 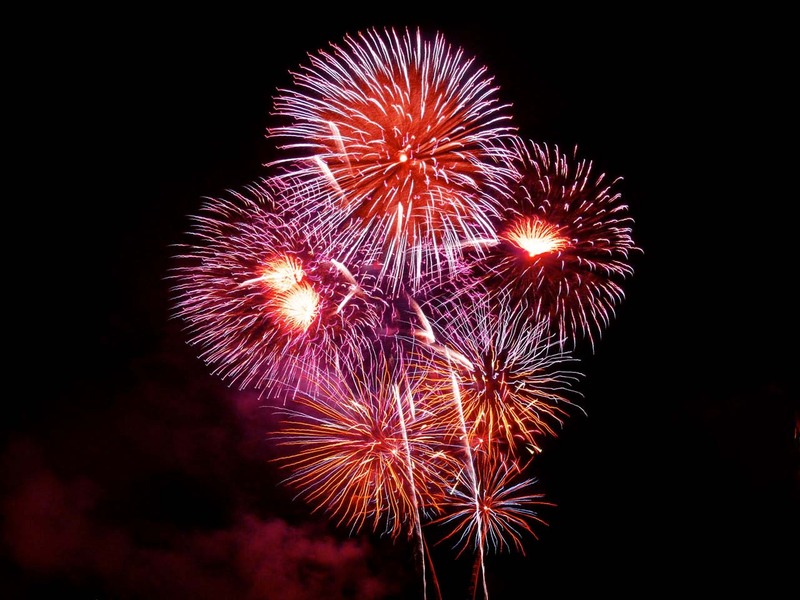 Have a safe and happy 4th of July! Fashion-and-merchandising student Allison Knowlton is a Creative Intern at Kreinik for the summer. She has begun to use Kreinik threads in her favorite techniques. Read on for Allison’s discoveries and suggestions for incorporating metallics into knitting. Have you ever spent hours, days, or weeks on a knitting project – be it a simple beginner scarf, or an extravagant fully cabled knee-length-and-hooded cardigan – and when you have finished and looked over your work you can’t help but feel like it needed a little something more? It looked like something was missing, or that it needed something to truly make it your own, not just a copy of someone else’s pattern. Like many artists, crafters, and young women, I love my creations to have “something special” like a little flair or sparkle. A little bling is eye-catching and easily adds dimension to a flat or monochromatic project. However, I often find that the beautiful and luxurious yarns that could possibly produce this result for me cost more than a “fresh-out-of-college” gal can afford. As a Senior in the Fashion Design & Merchandising program at West Virginia University, one of my graduating requirements is to participate in an internship. With my primary focus being in Design, I took an internship at Kreinik Manufacturing Co., Inc. in my hometown of Parkersburg, WV. The company is a locally owned and operated thread maker that specializes in metallics. From this blogger’s point of view, their threads are absolutely spectacular. The fine threads are perfectly blended with just the right amount of metallic to give any crafter’s project just that right amount of flair and shine. I have never worked with metallics in my garment or craft projects, let alone as a carry-along thread with my knitting – until now. 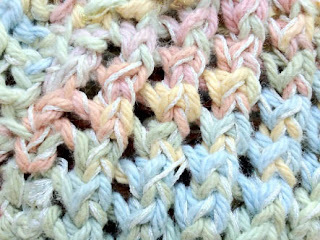 I began knitting a little over two years ago, and after my first project – a six-foot, very pink scarf with cables, bobbles, and lots of hand beading made from acrylic yarns – I vowed never to work with anything except natural fibers again. However, despite the luxurious look and feel of natural fiber yarns, I have never been able to shake the idea that my knitting could be so much more. This has been a prominent feeling with my knitwear, especially when working in cotton. Over the past two years, my peers who knit also seem to feel like there is just something that could give hand knitting that “extra” to make the pieces truly spectacular. Well my friends, I have found that something extra. For the past three weeks I have been knitting scarves, hats, gloves, and socks using metallic threads along with cotton and wool yarns. The results have been everything from very subtle (when using Kreinik Blending Filaments) to “in your face” (when using Kreinik Ombre). Kreinik has literally hundreds of threads and colors to choose from, all of which can be incorporated into your knitting. There is no guide to follow and no limitations on what you can do with using metallics in knitting; it’s all personal preference. For example, as I have been working with this concept over the past three weeks, I have grown to love the subtle impact of the Blending Filaments that Kreinik has to offer. As I began to create my first pair of socks however, I decided that perhaps the knitting could use a little more “umph.” In order to achieve this goal, I used not one, but two different colors of the Blending Filaments – perfect for sock and small stitch works as the thread is incredibly thin but very resistant to breaking – and for that final punch I added Kreinik Cable thread as well. Working with three different metallic threads at once was surprisingly simpler than I imaged, and the result was stunning. Tension (Trick) – This is key when working with any carry-along thread in knitting, especially thin metallic threads like Blending Filament. If you pay no attention to what you are doing you could potentially end up with some rather unflattering “bubbles” – or loose stitches – in the metallic thread. Tension (Tip) – This issue can be tackled. If you don’t mind wrapping your working yarn around your pinky once, and the carry-along thread around your pinky twice, then you might be in business! While this may not work for everyone, it can help. Patience and focus are also important so as to catch the unruly stitches as you go. 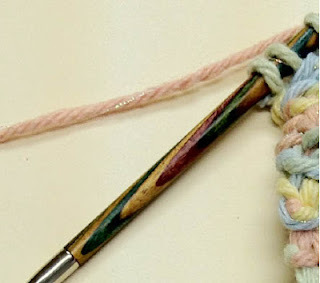 Separation (Trick) – When working with Ombre, which is a loosely twisted thread, it is possible to slip your needle through the middle of the thread, causing some unsightly stitches. Separation (Tip) – Let’s be honest, we all let our attention stray from our knitting from time to time, and it can lead to some rather frustrating – and easily avoidable – slip ups. Paying attention to your knitting not only helps you stay in pattern and can help you avoid common problems such as dropped stitches, but it can also help you keep from slipping your needle into the center of the threads. Two other tips to consider: 1. Twist your metallic thread with your working yarn as you go so there isn’t a chance to slip your needle into anything except the stitch. There are many other threads offered by Kreinik that are spectacular to work with and give that “special something” to your knitting projects such as Kreinik Gimp Threads, which are in the Machine Sewing Thread line, Tapestry #12 Braid, and Kreinik 1/16” Ribbon. All offer unique textures and light-reflecting properties for your knitting. As you can see, with a little – or a lot – of Kreinik Metallic Threads, you can quickly and easily add that something special to hand knits to make them your own and integrate flair and sparkle. The best part? In my opinion it’s not the gorgeous and high-end feel these threads can provide, but it’s the fact that even a “fresh-out-of-college” girl –on a tight budget –can easily afford it! 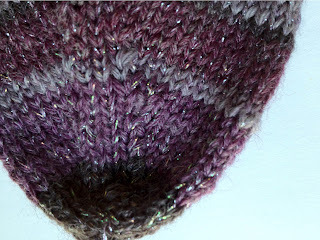 If you found yourself wondering what the downside was, or skeptically thinking that metallics are too hard, scratchy or flashy to use, I hope I encouraged you to explore the possibilities of using Kreinik Threads in your hand knitting projects. I challenge you to try them for yourself. I just know that you’re going to love it. By Allison Knowlton, Creative Intern at Kreinik Manufacturing Co., Inc., www.kreinik.com, June 2012.